We are pleased to announce a NEW collaboration between Charnwood and Country Living Magazine. 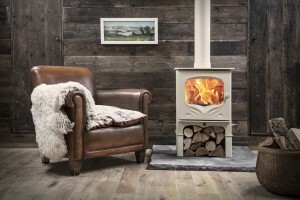 The Bembridge is a 5kW wood burning stove designed and made on the Isle of Wight for Country Living. Giving a nod towards a traditional wood burner The Bembridge engages the trend for the decorative yet still retains a modern, classic look. EXCEPTIONAL EFFICIENCIES The Bembridge uses the very latest combustion technology and has been designed and independently tested to stringent European standards making it one of the most efficient stoves on the market today. So low are the emissions The Bembridge is DEFRA exempted – allowing wood to be burnt in smoke control areas. Delivering 5kW of heat to the room the stove is incredibly simple to operate with one single air control and a removable door handle for safety. The Country Living Bembridge will be available from August 2015. Contact us for more information.